For our heat motility model we need at least a double knockout strain of B.subtilis. A knockout of both cheY and des are necessary. To obtain the double knockout strain, first a knockout of cheY is made after which the des knockout is inserted. A knockout of gene des is inserted into the genomic DNA of B.subtilis strain 168 with a tetracyclin resistance marker. 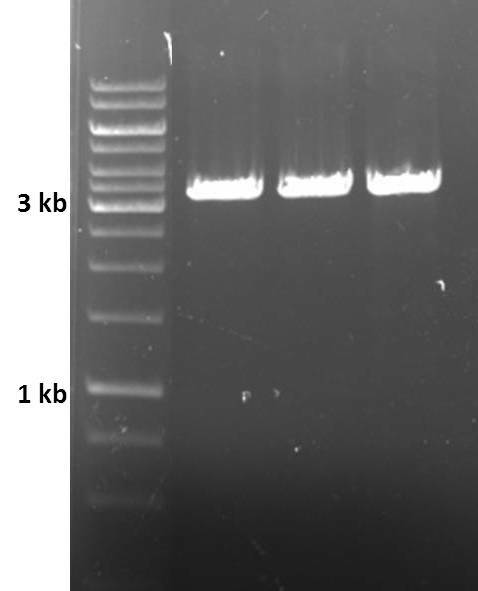 Colony PCR showed that des is indeed transformed into the genomic DNA (Figure 1). To observe whether or not the mutant strains are less motile than the wild type strain. Two different tests are done. To compare the motility of the wildtype strain with the two knockout strains, ΔcheY and ΔcheYΔdes, a motility assay is made. All the results obtained from this assay is from an experiment performed in triplo. When the strains are grown on a 0.4% LB agar plate, after 16 hours of growth it is visible that the wildtype strain shows more swimming behaviour than both of the mutant strains (Figure 2). A comparison between the two mutant strains indicates that ΔcheY has better swimming behaviour than ΔcheYΔdes. 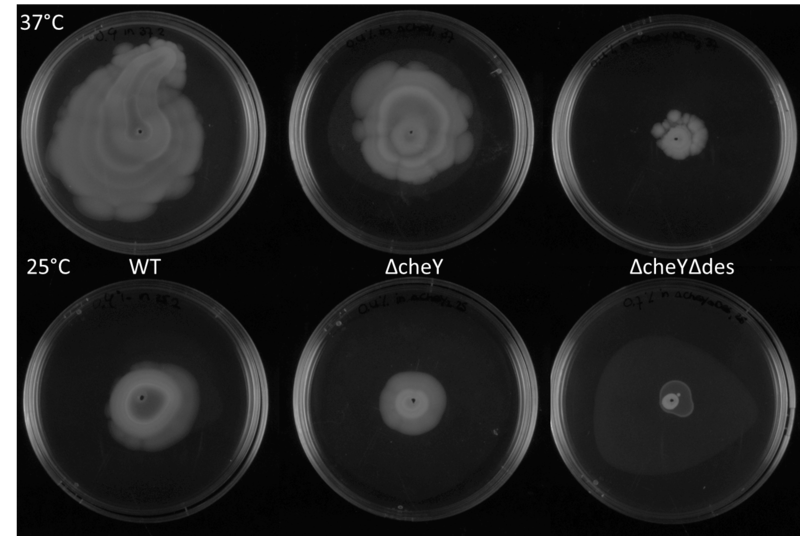 When the plates are incubated for 21 hours, it is more distinguishable that the wildtype strain shows more swimming behaviour than the mutant strains. A comparison at two temperatures, 25°C and 37°C, is made. A comparison between the strains at both temperatures shows that the wildtype strain swims better than the ΔcheY strain and the ΔcheY swims better than the ΔcheYΔdes strain. 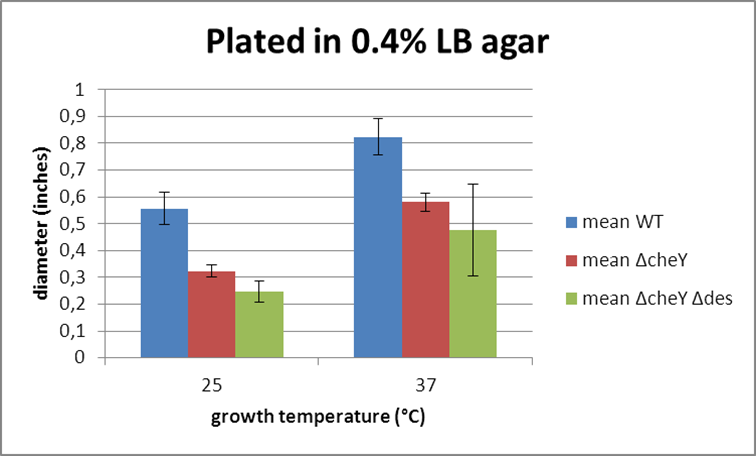 It is also visible that cells grow better when they are in a warmer environment (Figure 3). Figure 3: Motility assay results after 16 hours of growth at 25°C and 37°C. Another way of analyzing the swimming behaviour is to make microscope movies (4x real time). These movies are made for the wildtype, the ΔcheY and the ΔcheYΔdes strain. These movies show that the wildtype strain (Movie 1) is more motile than both mutant strains. The comparison between the movie of the ΔcheY (Movie 2) and ΔcheYΔdes (Movie 3) strain shows just as seen in the motility assay, that the ΔcheYΔdes strain is less motile than the ΔcheY strain.